Planned Pethood Taos needs volunteers who are willing to occasionally transport kittens/cats to the Española Valley Humane's clinic for spay-neuter surgery. For pet cats, the drop off time is by 9 am, and for feral cats the drop off is by 11am. Pick up time is between 3-4:30pm, so the round-trip travel & surgery is made in one day. Drop off can be made the afternoon before the next surgery day as well. Volunteers willing to help with Trap-Neuter-Return (TNR) of feral cats are needed. If you are willing to post flyers to help promote a spay-neuter, especially in areas of Taos County further away from the city of Taos, such as Carson, Questa, Amalia, Costilla, Ojo, Peñasco, please contact us at 575-613-4110 and we will mail you the flyer to post. 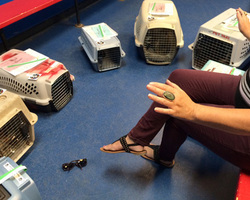 Volunteer practicing Reiki to keep cats calm at our mobile clinic.